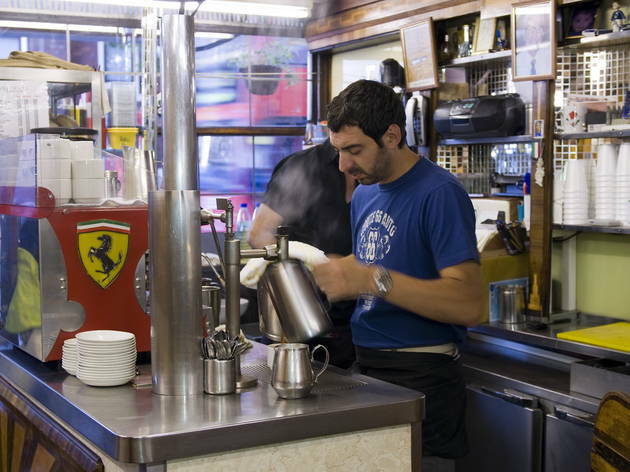 The East End’s pride and joy: a king among caffs. If ever proof were needed that all caffs are not equal, this Grade-II listed greasy spoon on Bethnal Green Road is it. The food may not be much more than reasonably above-average caff grub, but the atmosphere and decor are second to none. 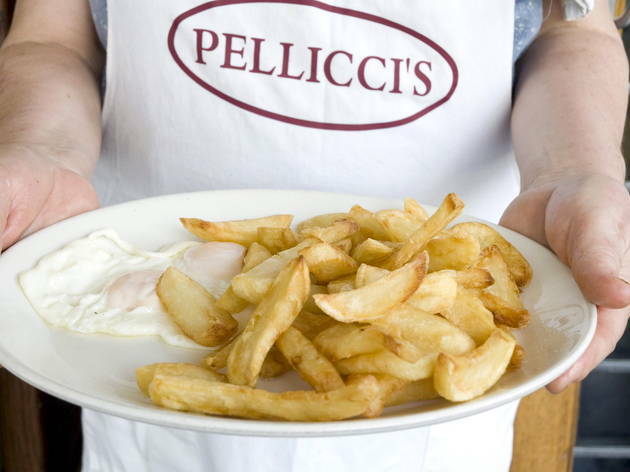 Opened in 1900, and still in the hands of the same family, Pellicci’s is an east London landmark. It has an almost opulent feel, harking back to a time when caff culture was king. Chrome-lined Vitrolite panels line the outside, and the wood-panelled interior is filled with Formica tables and art deco touches. 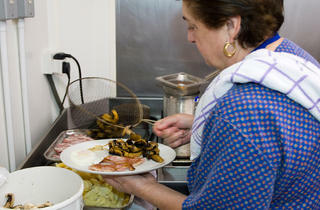 Food is still prepared with pride every day by Mama Maria – queen of the kitchen since 1961. The kids, Anna and Nevio Junior, serve it up with a wink, a smile and as much banter as you can handle. 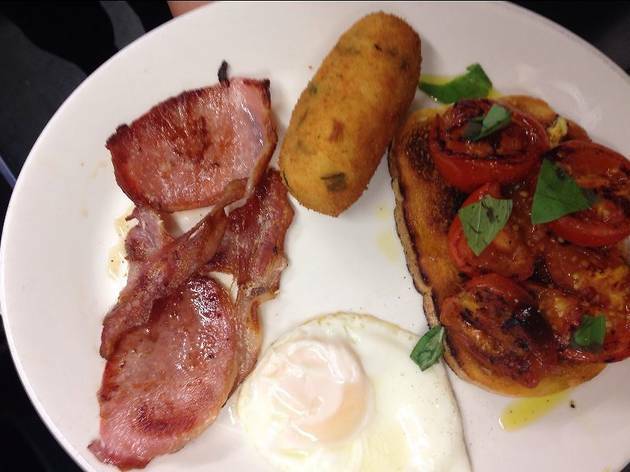 Fry-ups are first rate, and the fish and chips, daily grills and Italian specials aren’t half bad either. 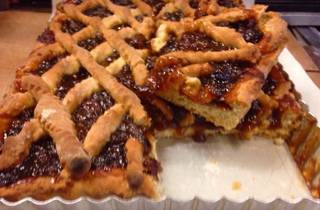 Desserts, from bread pudding to Portuguese pasteis de nata, are worth a punt too. But it’s the vibrant welcome, served with a healthy helping of mickey-taking, that makes the place so special. 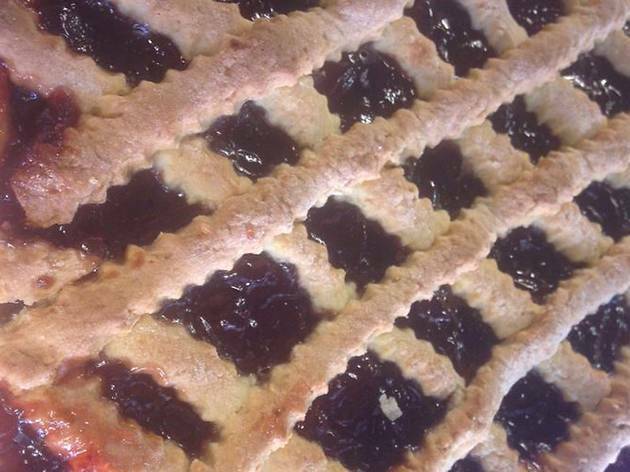 We're an authentic family Italian restaurant and cafe established since 1900, that's been focusing on providing freshly prepared, home cooked dishes since we opened our doors over 100 years ago. 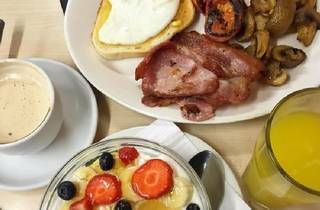 All dishes are available all day, whether it be a freshly cooked breakfast or muesli with freshly squeezed orange juice to a homemade steak pie served with hand chopped chips or a rich spinach and ricotta cannelloni. My Ultimate Fav in London... The vibe and atmosphere of the restaurant is a full adventure journey through out the home made exquisite meals. Had a vegetarian English Breakfast and I felt like my mom had cooked it for me... so incredibly good!... 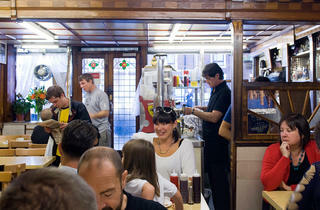 GUYS IF YOU HAVENT BEEN TO PELLICCI you are missing out London! Lovely honest cafe in Bethnal Green, the staff are super friendly and they do a great menu of breakfasts and Italian home cooking! It's grade II listed and also featured in the Tom Hardy film Legend! A must go to venue if you're in the area. 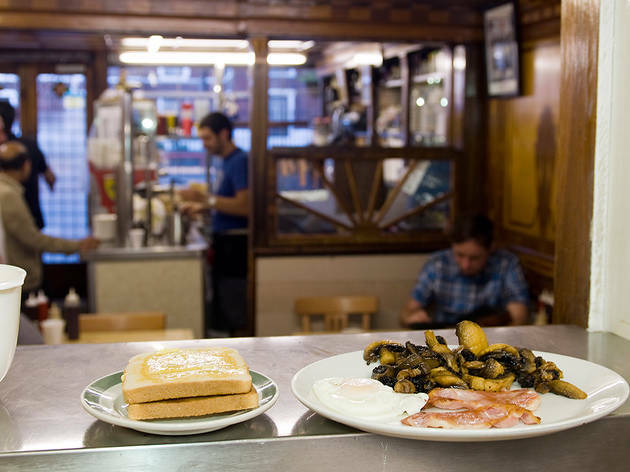 E Pellicci isn’t just your typical greasy spoon, it’s a place with tradition and lots of charm. My boyfriend is born and bred East Londoner so this is a place after his own heart. We managed to get a table, actually – we squeezed ourselves at one of the tables that was already half occupied and enjoyed the show that was shouting and laughing between employees in their half Italian, half Cockney lingo. I almost felt like I was being a part of immersive experience, sometimes forgetting I was here for food. Place felt so welcoming and homely, I want to come back so often, I become a part of Pelliccii community! 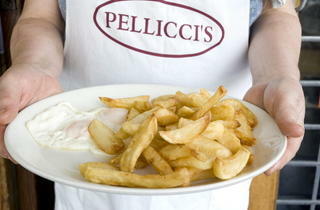 I discovered Pellicci thanks to a colleague that lives in the area. He brought me there for a breakfast with other friends and we had an amazing time. The owner gave us a very warm welcome and when he noticed I'm Italian he spoke to me in Italian and he explained a lot of things about the place to us. The decor of the place will bring you back to the '80 and will make you want to discover more about the place. I can't judge the food too much, I just had an english breakfast and it was good. I want to go back to try the pasta that looks very good from the photos. My absolute favourite place to eat. The food is second to none & you won't get a warmer welcome. This little gem in Bethnal Green is my second home. Keep up the good work. Not only for breakfast - absolutely stunning decor that takes you 80 years back, huge portions, homemade food and an atmosphere that brings Italian cafes in New York to mind. Probably one of the best places to visit if you want to experience the true East London spirit. I absolutely love the fact that even it's recent popularity didn't scare off the locals & regulars. Can't say a bad word about E Pelicci! Was I potentially late to work as I popped in here for a fry up on a Friday morning on my way back from Viccy Park? Not by much. Was it worth it? Yes. A thousand times yes. Sat outside and watched the world go by as I scarfed down sausage, bacon, egg, mushrooms & tomatoes. Even the tomatoes were delicious. That's saying something. Oh and fried bread. Cheeky! If it's your first time, just sit down and you will be served. Always know if you want a tea or coffee first. I got a fry up, tea and a chocolate croissant for about £9. The croissant was for my coworker. Because if you are going to be late, you may as well bring treats in. I think everyone won that day. This is a very special cafe and one of the jewels in the East End crown, with stunning Grade II listed art deco decor which has hardly changed for over a century, with the true vibe of a bustling a greasy spoon. It's been in the hands of the same family all that time is firmly rooted in East End history, and was even a favourite of the Kray twins in their time. As such the cafe makes an appearance in the recent film 'Legend', with Tom Hardy tucking into his full English in character. Food wise E Pellicci still serves up proper east end grub and you can't fault it, but they have no aspiration for Micheline stars as the place is always crammed full of hungry visitors keen to soak up the atmosphere as much as the food. The service is second to none and you are guaranteed to leave with a smile on your face. If visiting from afar there's plenty of things to do after breakfast within walking distance, Columbia Road, Hackney City Farm, Broadway Market, The Museum of Childhood and another legendary East End institution Bethnal Green Working Men's Club is also just round the corner too. 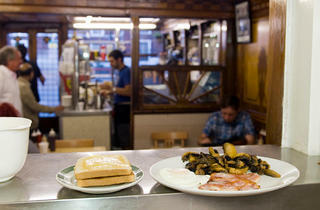 E Pellicci is a greasy spoon on Bethnal Green offering full English breakfast and Italian classics. I’ll be honest here. The food here isn't anything special. It's just your reasonably above-average caff grub. Delicious nonetheless but nothing out of the ordinary. Bethnal green isn’t exactly glitzy either. 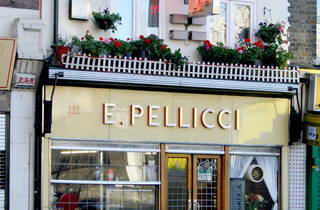 So why is E Pellicci so highly regarded by the locals? Well, for starters this place certainly has some history and it shows. The cafe is tiny but grade-II listed and beautifully furnished with vintage art deco along its walls with harks back to the halcyon days of the 1930’s. Opened since 1900, it’s been in the hands of the same family for the last 116 years and has welcomed famous (and infamous) faces including the Kray twins. Then we have the effervescent owner (I presume) who seems to know just about everyone in the neighbourhood. He was chatty to customers and it was quite brilliant to hear him rattle way in his cockney accent. What then surprised me was the ease at which is seamlessly switched to fluent Italian. Like I say, the fry-up was nothing out of the ordinary. 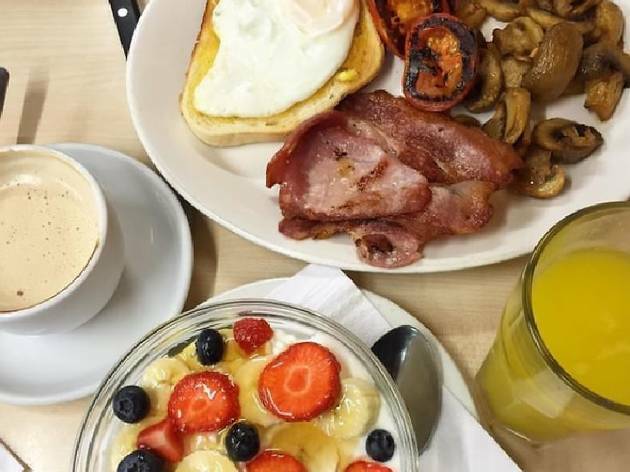 Don’t just order the Pellicci full English. Quantity is a little on the small side so add extra bacon, sausage or whatever you fancy. 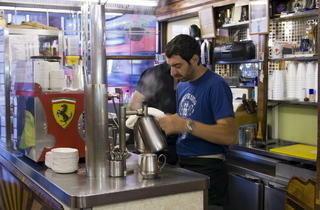 E Pellicci is small but the place is alive with activity and conversation. You might even strike up a friendly conversation with the locals. E Pellicci is a proper East End treat absolutely loved by the locals and it’s easy to see why. 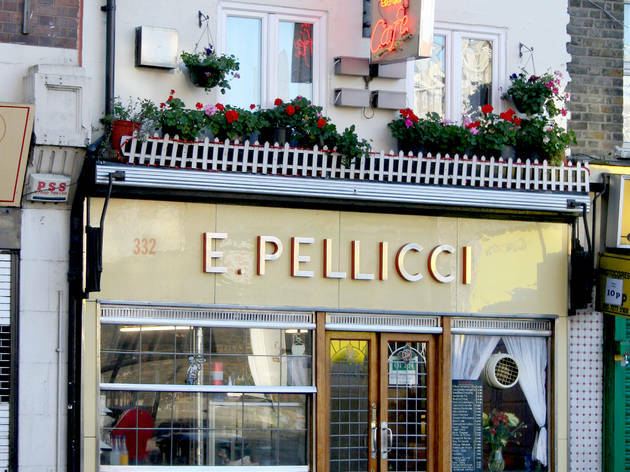 If you’re looking to experience London like a proper local, then a trip to the East End is where it’s at, definitely at E Pellicci. Highly recommended to go in the summer months when you can pull up a chair and tuck into your full English whilst nurse that hangover or just welcoming the weekend with friends. It’s the perfect way to start the weekend. Get there early though - it’s gonna be busy. 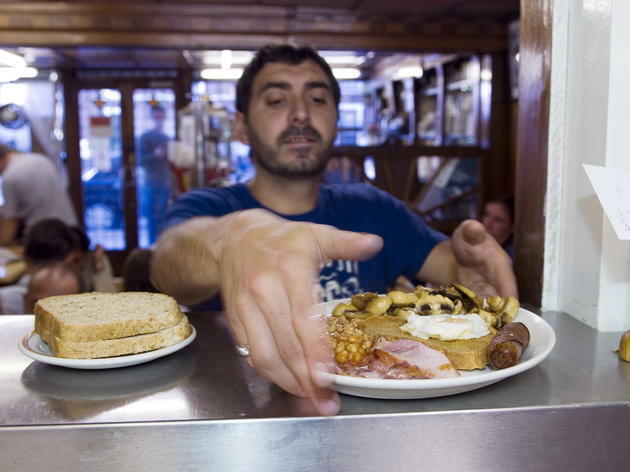 Probably the best greasy spoon and definitely the best service of any food place in London. I know I'm going to enjoy my meal, and the whole experience, if I eat here. The warm welcome, beautiful decor & delicious food also won't cost an arm and a leg. I had the best breakfast in my entire life there. Everything about this place makes me want to smile. Thank you E Pellicci. The best restaurant dining experience in London. Amazing family restaurant, it's been running for years and is the heart of Bethnal Green. Best fry up in London! If most cafes took one ounce of influence from how Pellicci's is run, they would improve themselves immeasurably. 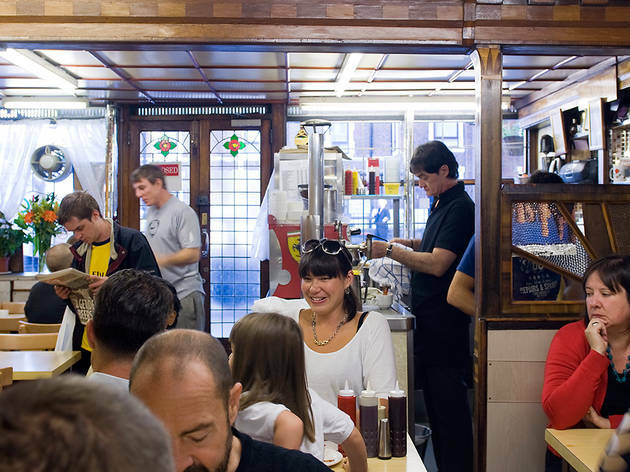 Pellicci's staff have hospitality in their blood, plain & simple, they love to make you feel welcome. + the nicest cafe interior in London. Best cafe! Has been for years. Pure East End grub at it's best. Best restaurant ever! Best crew ever! The Pellicci family are the best! No other cafe can ever come close in terms of community, banter, laughs and the food is top notch too! Truly our pride and joy! Its now my 43 year as a customer and nothing has changed , great food ,best coffee kind frriendly service , old and new customers always welcome ,a true taste of the east end and always a fun crowd inside and out of the shop.Theatre with food . Proper East End cafe, friendly and family run, great atmosphere and the homemade food is delicious as well as reasonably priced! Love this place! If it's good enough for the Krays then surely Time Out Readers can't be kept in the dark about this gem of a cafe. Not only is the hospitality warm but the portions are generous (see mixed grill in picture). The decor is old school with framed pictures of celebrities who have graced this venerable institution. There's an eclectic mix of customers which further adds to the ambience as well as the option of dining alfresco on the pavement. Definitely worth making the journey to Bethnal Green for a stodgy breakfast, however, would advise getting there before half 8 to get a place! I fiiiinally made it to E Pellicci before the queues began (8.30am if you were wondering) and had a fry up with a side of banter - banter, non-optional. 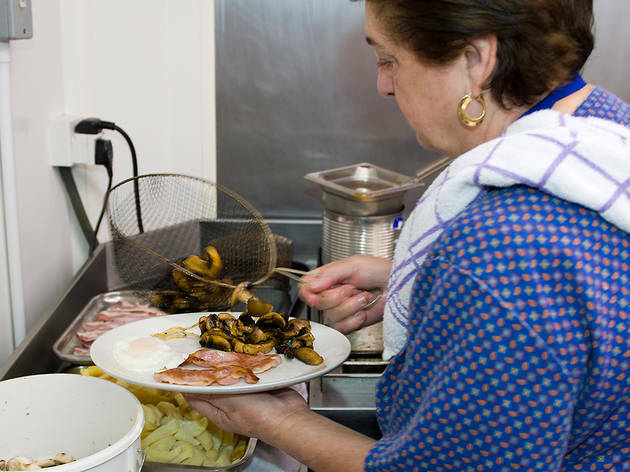 Honestly, the food is nothing special but if you're going to have a fry up, you may as well do it in bustling surroundings with a family of hosts with either super thick Italian accents or super thick East London accents who don't mind stopping for 5 minutes to get to know you! I took my family for a Kray's walk in east London. I was shocked it didn't end up at Pellicci's! So I did it on our own as I knew we would hear some more interesting news about the notorious twins there. It's always a great place to come back to anyway, as you feel like at home, Italian hospitality at its best! The food won't be the best Italian you've ever had, but you should definitely give it a go for the atmosphere! It will be loud, you will be rubbing elbows with strangers, but you will love it! 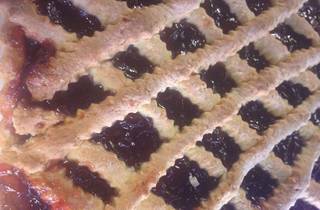 You can get a full English breakfast all day long too and home made pies. The family, who running the business from decades, will be happy to share stories not only about the Krays, but also other celebrities who visited their humble establishment over the years. And trust me, there are a few celebrities that have not passed their doors (if you need a proof, ask for the photo albums, there are piles of them!). The close quite early, 4pm, but noone is gonna rush you to leave the space before you finished. And if you're lucky, you can even get a slice of an fantastic polenta lemon cake for the way! This place is an East London icon. The staff are incredibly friendly and the food is hearty and delicious. What more can I say. A real east end cafe, with wonderful friendly staff and delicious food. Best place to eat or have a coffee in the whooole London area. E Pellici staff are like family! Lovely cosy place! Lovely family place, where everyone is really friendly and the millanaise scallop is delicious! You will have a great time. You will feel like home when you pass through the doors of this wonderful restaurant. Brilliant ! Delicious food with a friendly welcoming atmosphere, in authentic surroundings. 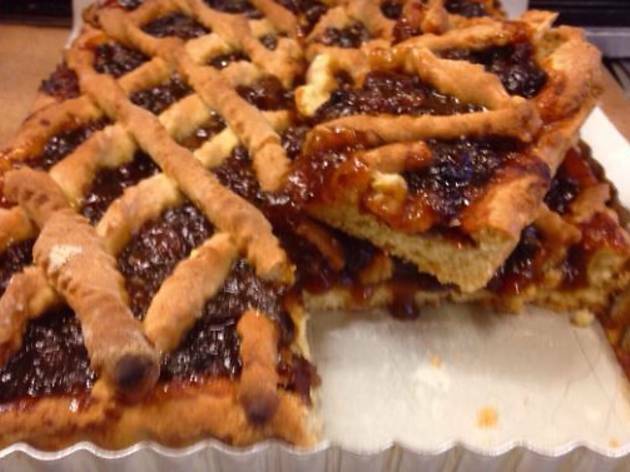 E Pellicci offers great homemade dishes traditional to the core and famous within its own right! The staff are all family and create the most amazing atmosphere. Warm friendly with lots of laughter and love! Look out for the special treat if it's your birthday. If your in Bethnal Green and you want a taste of the real East end. Pellicci's is the place. Famous for their great food, especially all day breakfast. Opened by parents and still being run over 50 years by the children, great fun and East end charm, very warm and friendly staff - well recommend a visit, some very famous people have visited here over the years, CHECK IT OUT!!! What an amazing place! Went there for Saturday brunch and was told that the packed environment was actually not as busy as usual. My friend and I were able to nab some seats at a table - everyone is super friendly, service makes you feel literally at home - and the food is amazing value for your money! (I suggest the mixed grill - a super-sized English breakfast with a side of chips.) I will be a regular!! Excellent food, very fairly priced with very friendly staff and atmosphere! Shall be going again very soon. Great place with great people. Amazing value.